After first login you are redirected to your profile page. From this page you will be able to add new websites, manage them, edit, view their dashboards, create reports and change your password. In order to add a website to your profile, you have to create profile pages of your organization and publisher first. 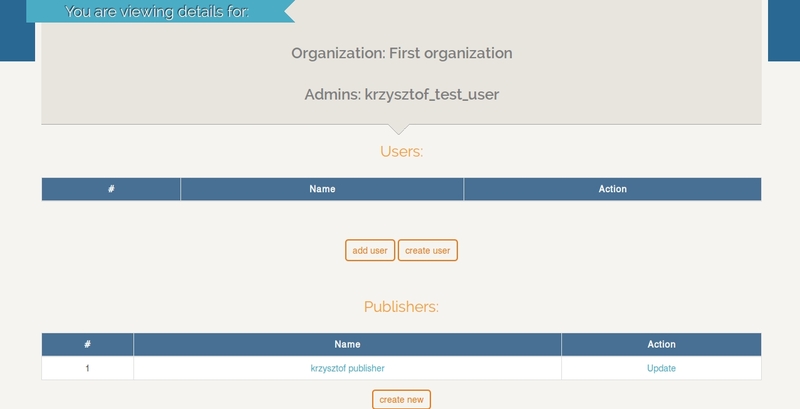 To do this, click on the orange button "please configure your organization first". In newly opened site please fill required information and click the "save" button. 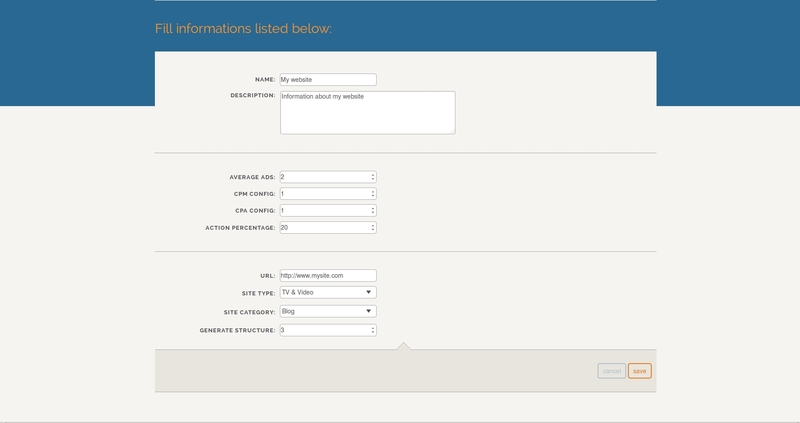 You have now created profile pages for your organization and publisher. From your profile page you can add a new website by clicking the button "add new", located just above the "Website list" table. After filling all fields, you can save entered data by clicking the "save" button. You are now redirected to the installation guide subpage, on which you can read about how to install required scripts on your website in order to start data collection. Upon installation of scripts in accordance of installation guidlines you can check whether everything went fine by clicking "check installation" button located just below the installation guide. 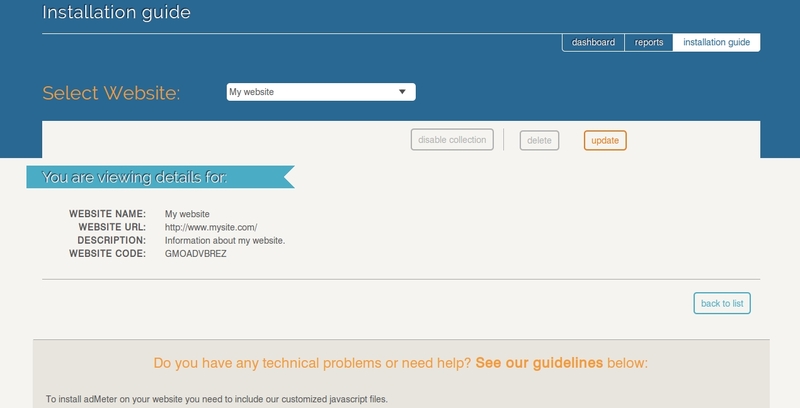 From installation guide subpage you can now go to your website's dashboard by clicking the "dashboard" tab. In dashboard panel, you can choose the type of date range for which you want the data to be displayed, by clicking on proper button located below the "VIEW BY" label. 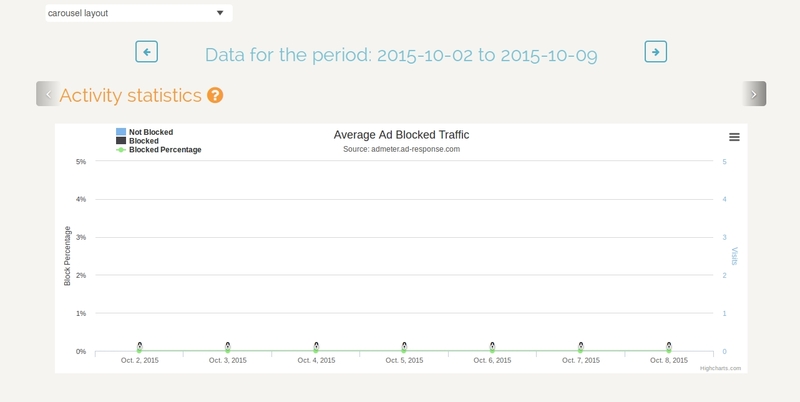 You can choose to view data by year, month, week, or day. By default dashboard will select the week range. After selecting type of desired date range you can also choose specific date, which will be the begining of the period for which dashboard will display data. Choosing specififc date can be achieved by clicking on input field located below the buttons with type of date range, selecting desired date and clicking "select" button. To see data for previous or next period you can just click one of the arrows located on both sides of the header with information about current period. Dashboard's layout can be changed by selecting desired layout from dropdown menu located between main upper panel and header with information about current period. Possible layout options are: vertical layout(default) or carousel layout. 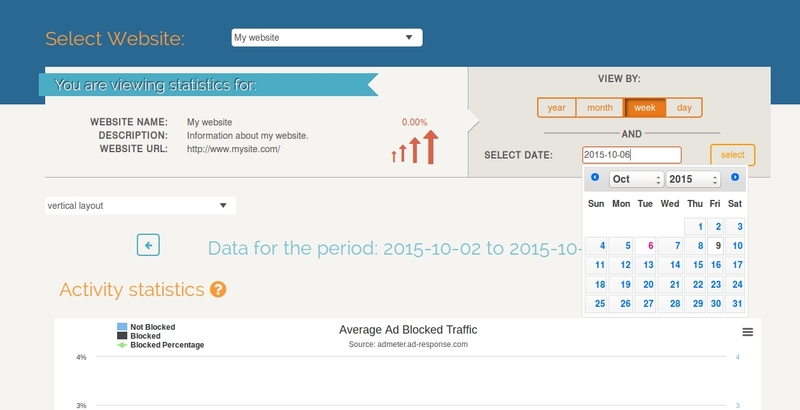 For quick access to dashboards of other websites you can go to "dashboards" subpage. Additionally, after hovering with mouse cursor over the "dashboards" link, you will be shown a list of your top 20 visited websites. 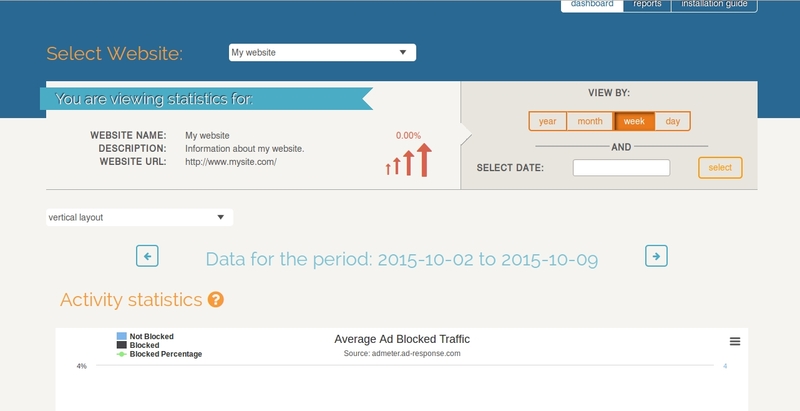 Upon clicking the name of the website from this list you will be redirected to its dashboard. 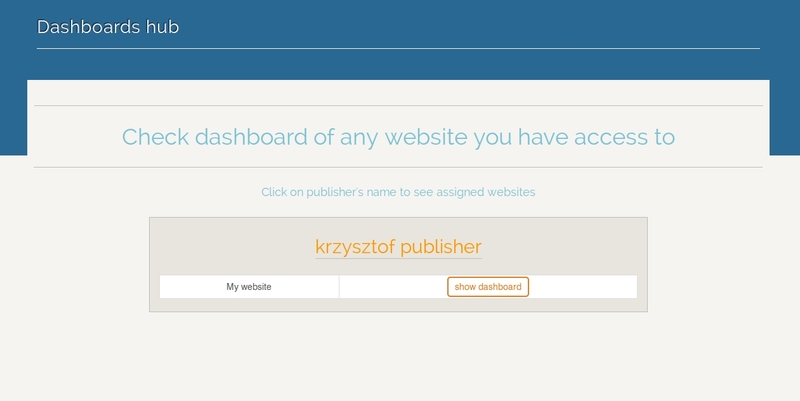 While on "dashboards" subpage you can click on publishers name to see websites of which dashboards you have access to. To view detailed information about organization or publishers you are a member of, you have to click on its name in organization/publishers panel from your profile page. 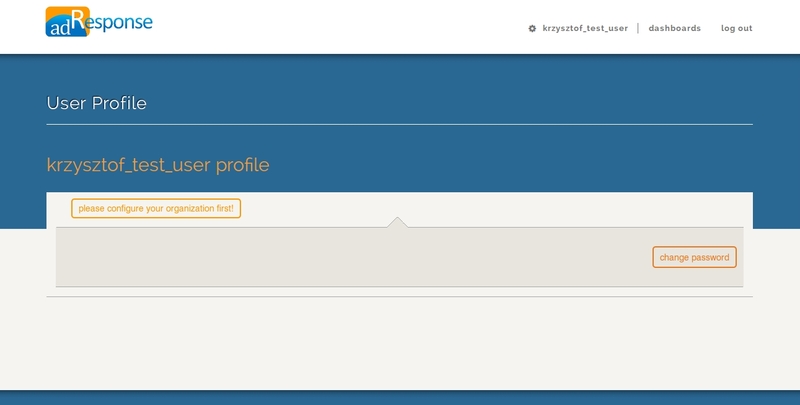 You can quickly go back to your profile page after clicking your username from top menu, right to the cog icon. 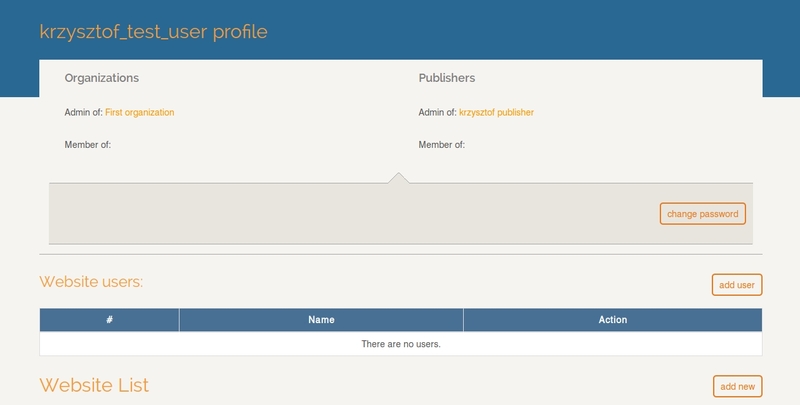 After clicking on publisher's name from your profile page or organization's page you can view chosen publisher's page. 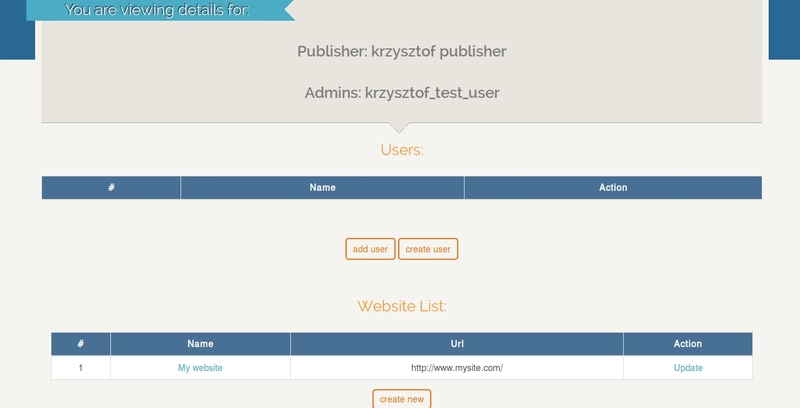 If you are administrator of given publisher, you are able to manage its users and websites.